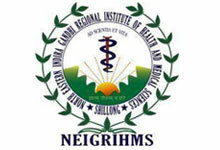 NEIGRIHMS Jobs Recruitment Notification 2018.North Eastern Indira Gandhi Regional Institute of Health and Medical Sciences inviting applications for the positions of Senior resident doctor posts in anesthesiology, anatomy, cardiology, community medicine, CTVS, forensic medicine, general surgery, medical oncology, general medicine etc departments.Interested and Eligible candidates can apply for the positions. Total number of vacancies to be filled in NEIGRIHMS is 55 for Senior resident doctors in various departments given below. Post graduation degree or diploma holders in concerned discipline from a recognized university can apply for this job advertisement. Maximum upper age limit for contenders is 37 years. Selected candidates as SR doctor will get pay in the level 11 of Rs.67,700/- per month. Selection Process:On basis of interview test candidates will be recruited. Along with all essential documents on 17th September 2018 candidates can appear for NEIGRIHMS recruitment.